My BRAND PROMISE to you is E4: Energize, Educate, Entertain AND Easy to work with! Travel requirements for Motivational Humorous Keynote Speaker Conor is happy to travel coach class to your next event. Conor is an award winning humorist whose accolades include Chicago Humorous Speaker of the Year for a speech-would you believe-on Customer Service in San Quentin Jail!! 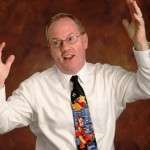 Conor Cunneen is a former Chicago Humorous Speaker of the Year. Listen to Customer Service in San Quentin! HEALTH WARNING: Please be aware that as this audio clip is likely to lead to intense laughter, you need to have a strong heart and a constitution as robust as the Cliffs of Moher!